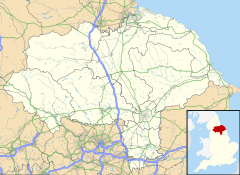 Cononley (/ˈkʊnlə/ or /ˈkɒnənli/) is a village and civil parish in the Craven district of North Yorkshire, England. Historically part of the West Riding of Yorkshire, Cononley is in the Aire Valley 3 miles (5 km) south of Skipton and with an estimated population of 1,080 (2001 est. ), measured at 1,172 at the 2011 census. It is situated 0.9 miles (1.5 km) west of the A629 road with access to Skipton, Keighley. Also joined to the Leeds-Carlisle railway, the village has commuter access to Leeds and Bradford. The village is served by Cononley railway station. The settlement dates back to medieval times when much of the cultivated land formed part of the estate of Bolton Priory. Most dwellings in Cononley date back to the 17th century; the oldest surviving building (Milton House) dates from 1635. It is rumoured[by whom?] that 'The Old Hall' part of Cononley Hall, which was thought to have been a Jacobite safe house in the 18th century (escape tunnel in the fireplace), could be much older. It has a stone in the loft dated 1436, whilst the other half of the house mostly dates back to the first half of the 19th century, which was when the village was a centre for handloom weaving and lead mining. By 1851 the population of Cononley had grown to 1,272. In the late 19th century most people in Cononley were employed in one of the two village textile mills. Today, with a population of 1,172 (2011 Census), farming is still significant, and there are still a few local businesses. The number of people employed in industry within the village has radically declined over the last 25 years. Housing development in the 20th century was very limited due to the lack of economic growth. Part of the working community in the village commute to Skipton and Keighley, and a large number travel long distances, this made possible by frequent electric trains to Leeds and Bradford. The village has a joint Anglican-Methodist church, a primary school and one public house. ^ a b UK Census (2011). "Local Area Report – Cononley Parish (1170216738)". Nomis. Office for National Statistics. Retrieved 25 March 2018. ^ "OL21" (Map). South Pennines (A2 ed.). 1:25,000. Explorer. Ordnance Survey. 2008. ISBN 978-0-319-24012-0.